Whatever Happened To Wayne Rooney? 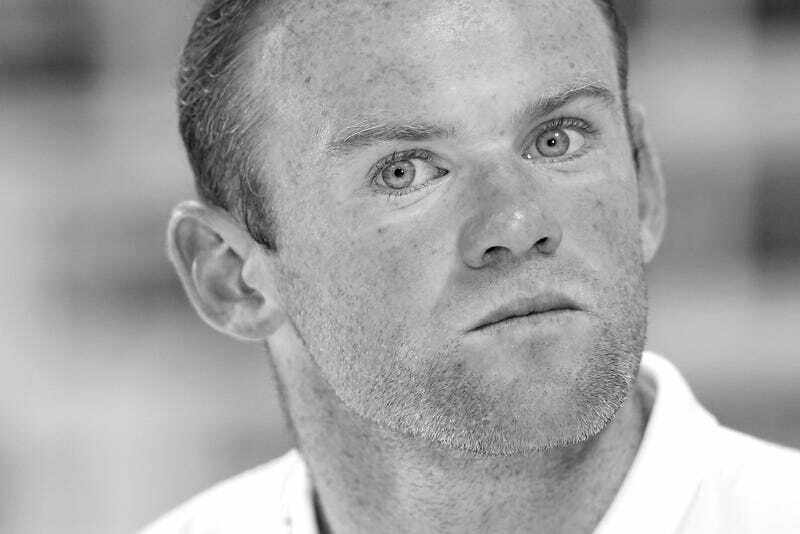 Wayne Rooney is a paradox. That isn't a sentence that anyone ever supposed to write, but, well, there it is. No one who saw him erupt will forget the visceral thrill of watching him play, skill and will capsizing the natural order. He was still 16 when he scored his first league goal, a brilliant late winner against Arsenal—defending champions and unbeaten in 30 games. A year later, his excellence helped England to the 2004 European Championship, the tournament consumed by him until injury intervened. He then signed for Manchester United, scoring a hat trick on debut, and for two seasons was more or less their sole redeeming feature. During that period came a game against Newcastle, when, engrossed in a row with the referee, he spied the ball dropping close by; dashing off, he hurled his whole body into a screeching, swerving volley that epitomised a compelling, charismatic competitor. Aggressive, instinctive, unique and absurd, his was a transcendental talent able to commandeer a game featuring 21 other players and make it entirely about him. Not any more. Once a fantasy player, he's now a fantasy league player, relentlessly accumulating goals and assists but quickening neither pulse nor step. Of course, he still produces the occasional moment, but the momentous occasions are rare—and even more tellingly, he just isn't any fun. Quite why this is so is impossible to discern with absolute certainty. Throughout his career, he's been messed around positionally, but the adaptability that prompted it was central to what made him so good, a complete footballer able even to keep goal. More likely, lifestyle, longevity and injury are to blame, the disappearance of the burst, that sudden forcefulness, evidencing a Rooney on the wane. Which is why, for the first time, his England place is under threat, though he has already endured the same at club level. Between 2007 and 2009, he was obliged to do chunks of Ronaldo's running, fairly easily rationalised as testament to his selflessness, and deference to an influence that superseded his own. Then, when Ronaldo departed, he seized the leading role, unstoppable for a period in 2010 before injury curtailed him, and though he has never been quite the same since, he remained essential afterwards. But in the summer of 2012 Robin van Persie arrived at Old Trafford, the manner in which he assaulted his first few months causing Rooney a problem. The striking position was gone, with the supporting role earmarked for another new signing, Shinji Kagawa. When United faced Real Madrid in March, he was left on the bench, and by May, had lost his place in the squad, Alex Ferguson spinning and dissembling as hard as possible to ensure his departure. It is true that, by the end, the pair did not get on, but similar to-dos with Paul Ince, Ruud van Nistelrooy, and Roy Keane are so strongly linked by expired usefulness as to suggest managerial contrivance. But David Moyes either disagreed, or determined not to establish an obvious line of potential blame by selling Rooney to Chelsea. Working on the Holland-Spain game for the BBC, Rio Ferdinand noted that under him, van Persie "went from being the star man, our go-to guy, the top scorer, to being almost like a sideshow. I think that the dynamics changed. The manager, David Moyes, was talking up Wayne Rooney." So Rooney was awarded a new contract, theorized to be as much on account of his commercial value as footballing prowess—the only fathomable explanation, given its length and terms. But with Moyes now gone and Van Gaal installed, his usurpation by van Persie, both as focal point and captain-elect, is a formality. With England, so poor for so long, the process has been slower, but the new cohort of fast, dexterous, and imaginative players has drawn attention to the frequent poverty of his passing and first touch. And belatedly, Roy Hodgson has noticed—just not before establishing Daniel Sturridge in the number nine position that is now Rooney's best. So he ended up at ten, where a succession of sketchy performances led to his replacement there by Raheem Sterling, and, marooned on the wing, he could no longer adapt, raising the possibility of his being excluded altogether—though he would surely make a better right-back than Glen Johnson. Against Italy, Rooney—England's top scorer in qualifying—was excluded from the majority of their best football, a schlepper schlepping to minimal effect and possession foundering at his feet. But then, the paradox: a wonderful cross to supply Sturridge with an open net, and later, the movement that created England's only chance once they went behind. Or, put another way, his team's two most telling moments involved him, and though he missed an important opportunity—it happens—the finish he attempted, an expert's drag inside the near post, went only just wide. Though his performance was by no means England's worst, the dominant domestic narrative—an innocent and likable side, narrowly bested—makes him a more palatable scapegoat than defensive vulnerability, midfield subservience, and managerial impotence. And yet, Rooney knows his own standards; even ignoring the body and facial language, his insecurity is clear from the things that he has said. More than once, he has announced his extra training, and also made clear a continuing understanding that selection must be earned. Perhaps so, but on returning to the team hotel after a hospital visit in 2006, he reportedly declared that "the big man is back in town", played in 2010 despite pre-existing injury, and was taken to Euro 2012 despite a two-game suspension, decisions which attracted neither criticism nor quibble. All this serves to make his acquaintance with fallibility all the more painful, a superhero divested of his special powers at the very moment he anticipated their zenith—even if much of the campaign for his exclusion suggests a more personal agenda. And, perhaps worst of all, a revisionist notion now asserts that he wasn't that special to begin with—though the defenders he mesmerized and brutalized, beat up and beat down, attest to the contrary. From his early days at Everton, Rooney has enhanced performances and reputations, masking the shortcomings of those around him—roughly, the function of an individual within a team. This time, though, others must do likewise for him, not because he's earned it, but because, despite it all, their need for him demands it. Daniel Harris is a writer, in shorter-form and about sport, mainly for The Guardian. His most recent book, The Promised Land, tells the story of Manchester United's treble season, and he can be found on Twitter @DanielHarris.